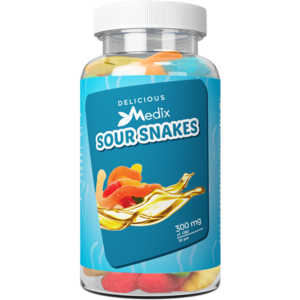 Medix CBD infused Sour Snakes will tastefully slither their way into your daily regimen of CBD dosing. All your favorite cheek pucking flavors all in one place. Their delicious CBD gummies are infused with top quality Phyto-cannabinoid-rich hemp oil. These CBD gummies are American made and carefully prepared for the ultimate CBD experience with every tasty bite.